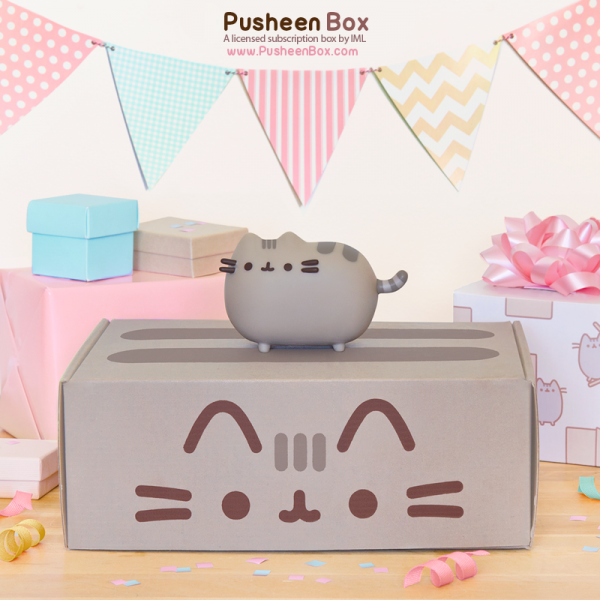 We’ve reviewed a lot of subscription boxes on SCK but one you were all very interested in from our reader survey was the Pusheen Box, a box dedicated to everyone’s favourite lazy cat! After seeing all the cuteness in the Summer and Fall boxes, I decided to order the Winter box and see if it’s worth the money. 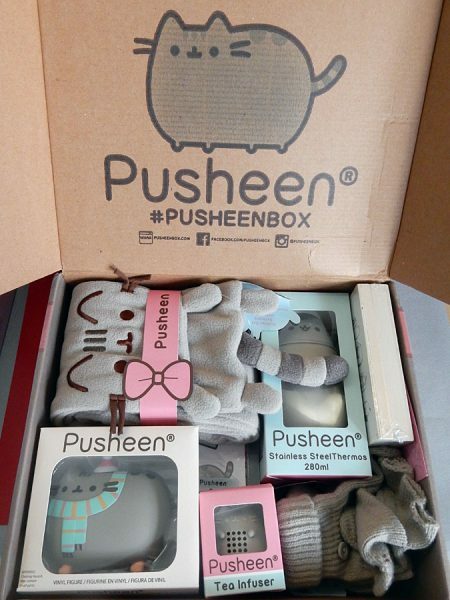 Pusheen Box is a bit of an investment for those of us outside the US as you’ve got international shipping and a likely customs fee on top of the box price. I’ll detail all the costs at the end, once you see what’s inside. It was shipped by standard airmail and arrived in a couple of weeks. 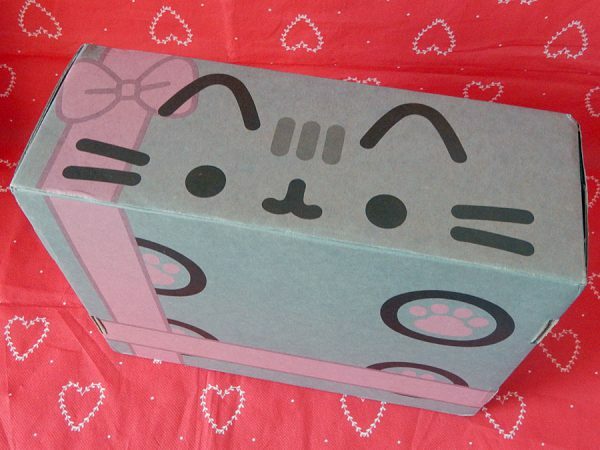 The box itself is completely adorable – let’s face it, we’d probably spend quite a lot just to get the box. 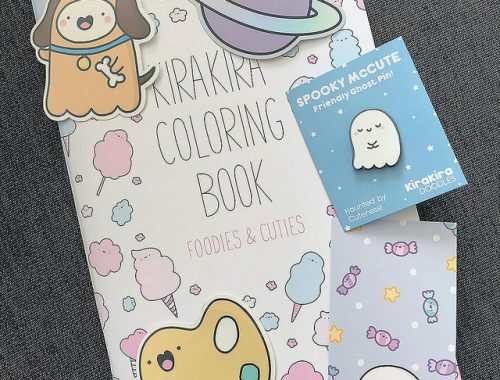 The box was packed full of Pusheen items – they promise you get over $100 worth of themed seasonal items with all new and exclusive products and they really do fill the whole space. 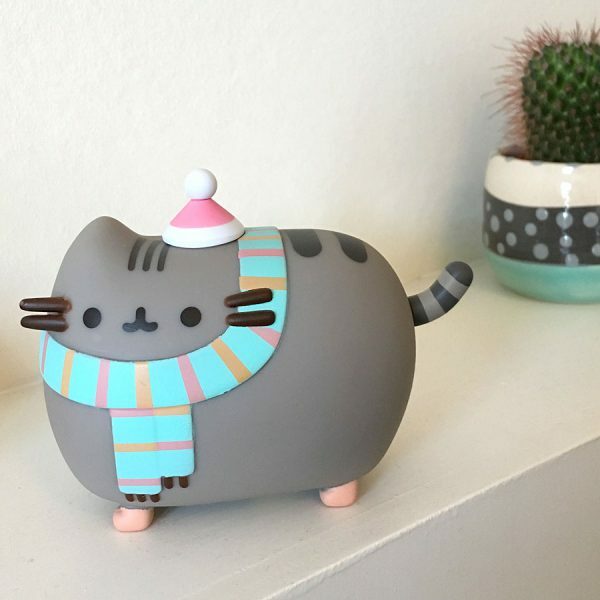 Every box has an exclusive vinyl figure and the winter box has Pusheen in a scarf, hat and boots! I love winter designs so this immediately joined my Christmas decorations and will be staying up until the spring. When you subscribe, you’re asked for your t-shirt and shoe size so you can get fun wearables and the winter box includes a cosy scarf and gloves. 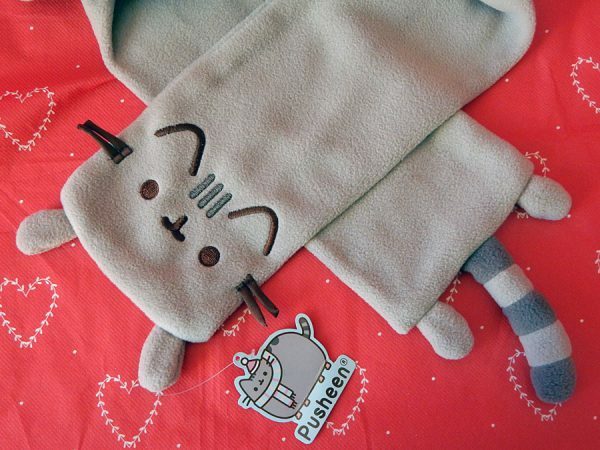 This scarf might be the cutest one I’ve ever seen – it’s made from super warm fleece with embroidered details and little paws and tail. I love it so much. 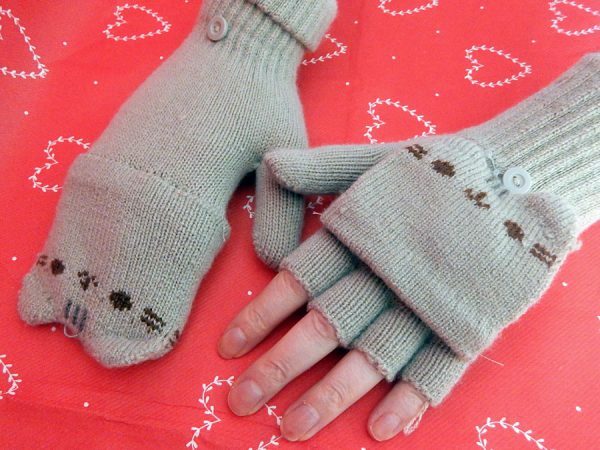 I’ve been needing a new pair of gloves too and these are kawaii and useful as they’re both fingerless gloves and mittens. 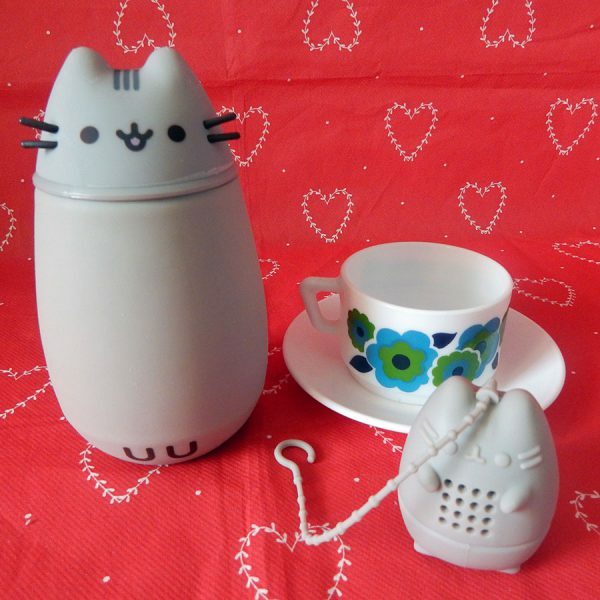 Also fitting the cosy winter theme was a thermos flask and tea infuser so you can hibernate with a hot drink. 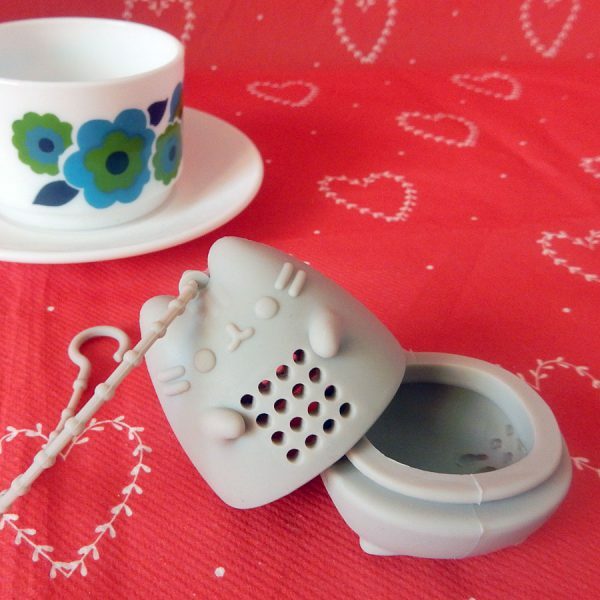 The infuser gets top marks for cuteness but I’m not sure how practical it is as the holes are rather large and it looks difficult to clean. 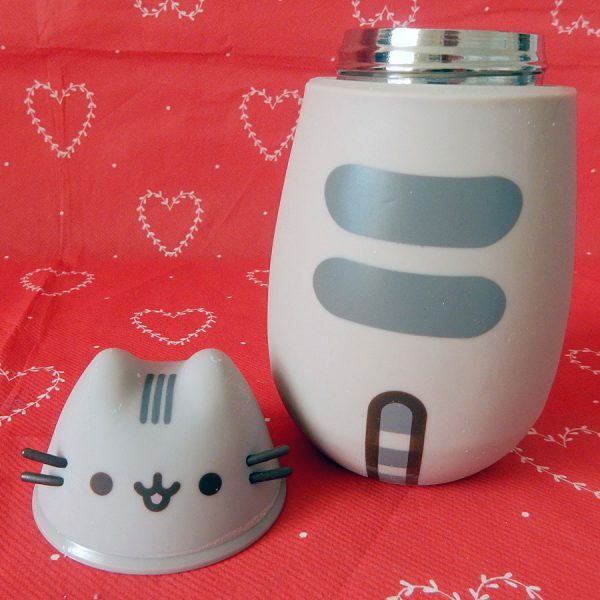 The thermos is quite a mini one so perfect for popping in your pocket when you’re out for a walk on a cold morning. 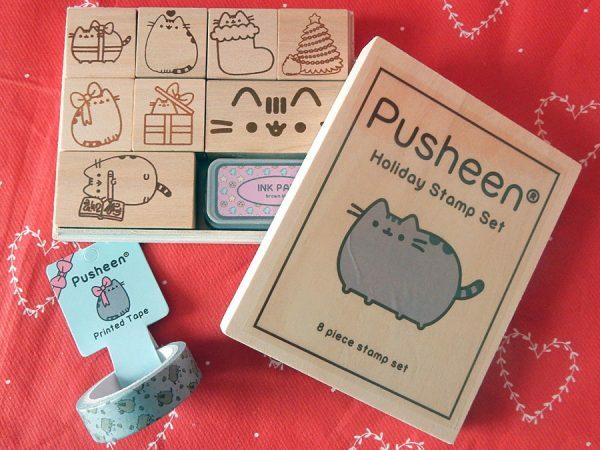 You need to include some cute stationery and this box of stamps was one of the most fun items to play with. It contains 8 stamps in two different sizes plus a mini ink pad, all packed in a wooden box. 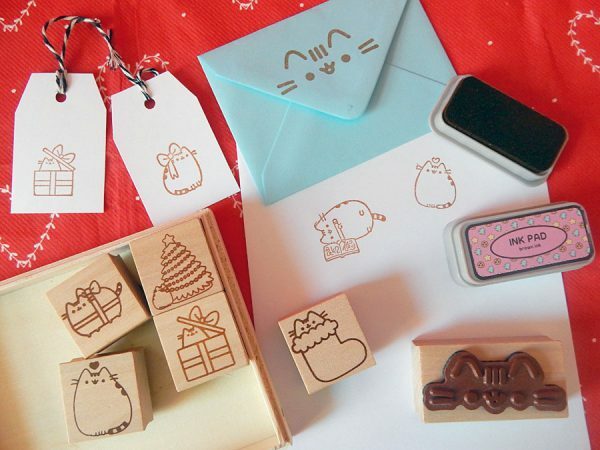 The stamps are good quality and stamp really well and all the designs are so cute. The Christmas and gift designs are perfect for tags and you can also use the stamps for decorating mail and all sorts of craft projects. The brown ink isn’t the most exciting colour but ink pads are cheap enough to add your favourite colours. Since it didn’t ship until mid-December, they wisely didn’t include too many Christmas items and this gift wrap and tags set can be used all year round. That’s if you can bear to use it – I’m not sure I know anyone deserving enough. 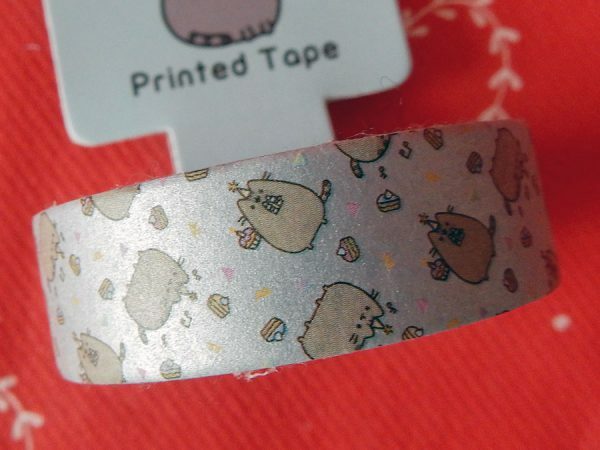 There’s also some Pusheen washi tape to add some sparkly cuteness to your mail. 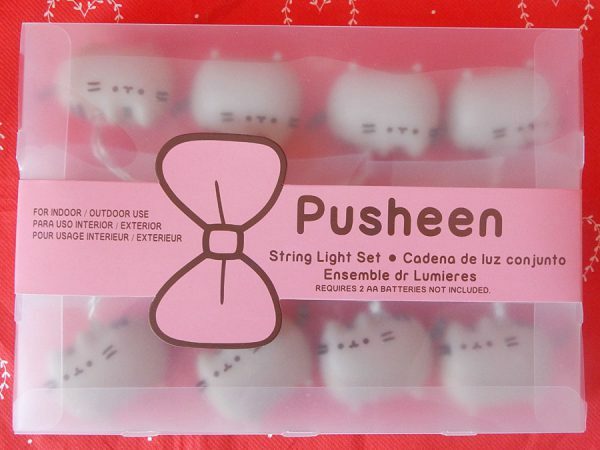 Right at the bottom of the box was something very cool – Pusheen string lights! I was so excited about these as I have snowman lights up all year round and thought these would make a fun change. Look how cute they are! It’s quite a short string but they’re battery operated so you can use them pretty much anywhere, even outdoors. Unfortunately, they’re not very bright! 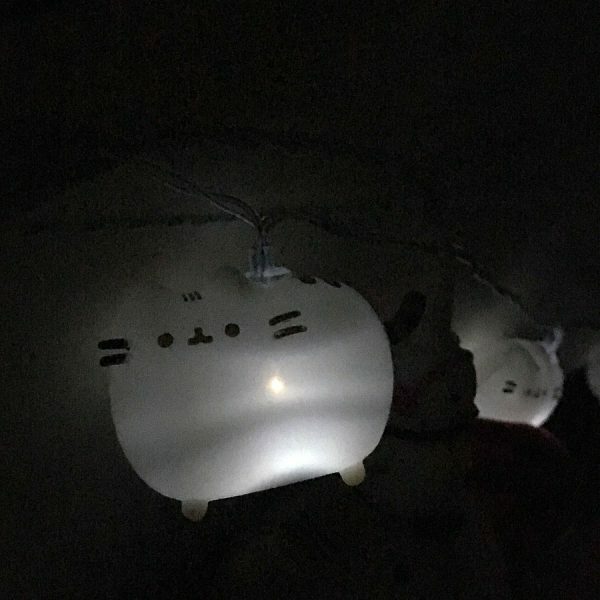 With the room lights on, you can’t tell if they’re on or not and with the lights off, they don’t really illuminate anything. They’re still one of my favourite items though and I need to find somewhere fun to hang them. So, let’s get down to hard cash. 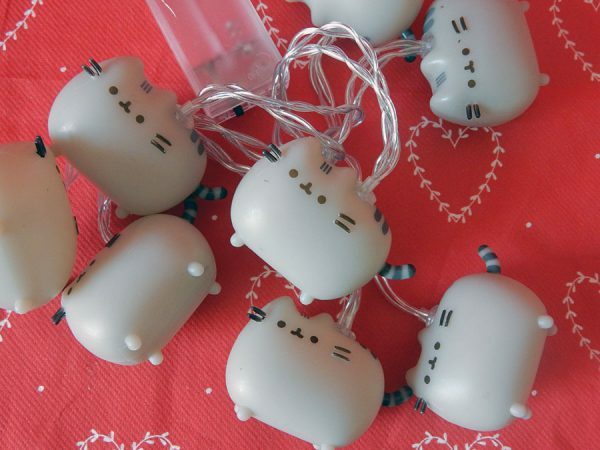 The Pusheen Box costs $43.95 + $6 for shipping within the US and $25 elsewhere. For me in the UK, that’s almost £56. I was pretty much guaranteed a customs charge, which was a painful £15.10 so altogether it cost me £70.87. That’s a lot of money! 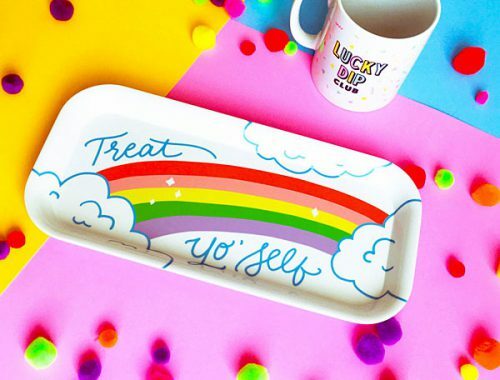 The items are worth at least $100/£80 so you’re still not out of pocket plus some items are exclusive to the box so you can’t get them anywhere else. 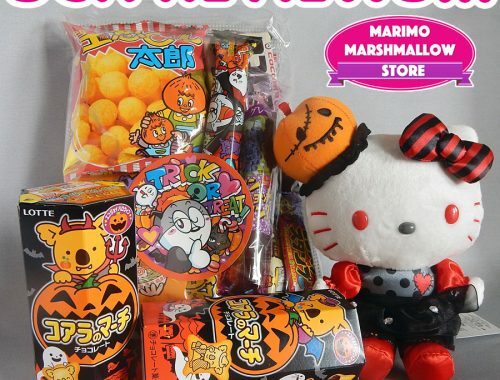 Everything is really good quality and packaged nicely and you’ll be among the first to see these products. Even if there are a few things you won’t use, you should have no trouble finding new homes for them. 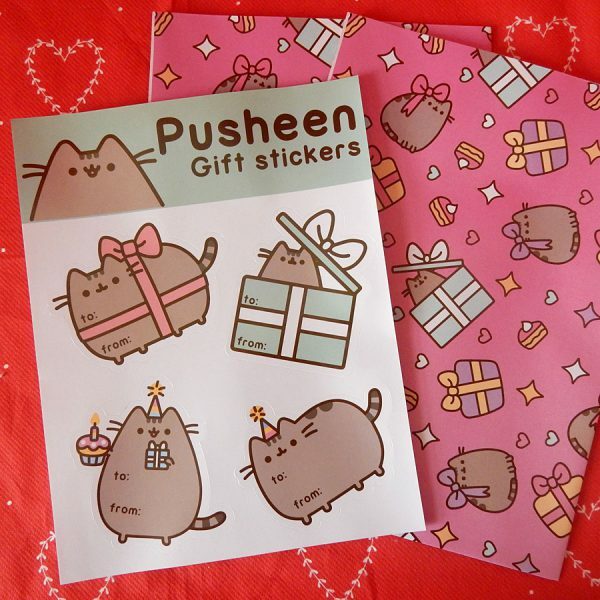 Overall, I think it’s definitely worth buying if you’re a Pusheen fan in the US, but international fans might want to limit yourselves to a box or two a year, for your birthday or Christmas, and choose a box that’s most suited to your lifestyle. The winter box is perfect for me but less so for someone who lives in a country that’s hot all year round. I’m trying to decide whether to cancel my subscription or get one more box since my birthday is in the spring. 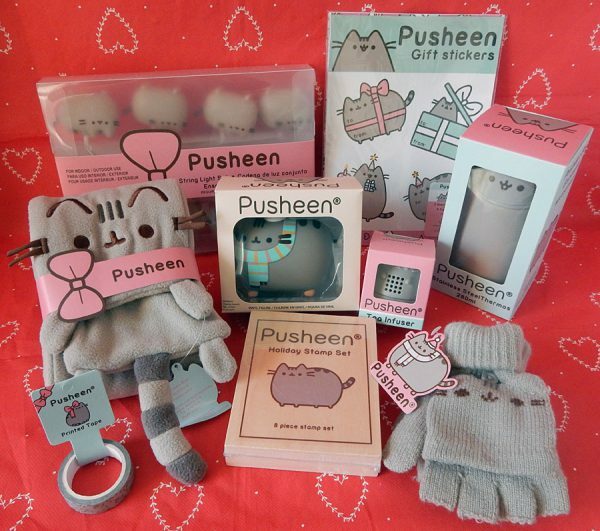 Check out the Pusheen Box site to find out more about how it works. They’ll be opening signups for the Spring box soon, which will ship in mid-April. What do you think – will you be subscribing? Oh yes I loved this box. Wow! I didn’t realize how expensive it would be for you guys overseas. I’m from the u.s so the shipping is cheap and basic, but I didn’t even remember customs. I knew Australia and Canada has some extreme prices but jeez! I am so looking for the spring box even more so since I got to see the first preview. Yeah It would be a more wiser choice to be more selective with the boxes since in the uk I presume it’s more cold. Summer box wouldn’t be a good choice but maybe the spring or fall for you.